The Styx River, 24.8 kilometres long, has two main tributaries, Smacks Creek and Kaputone Stream. Several other smaller waterways, both natural and constructed, drain into the Styx River before it enters the sea north of the city of Christchurch via Brooklands Lagoon and the Waimakariri River. As indicated by the Black Map drawn in 1856, when early Europeans settled in the area, the Styx River and its tributaries were surrounded by extensive wetlands. There was also a possible tributary link to the much larger Waimakariri River. 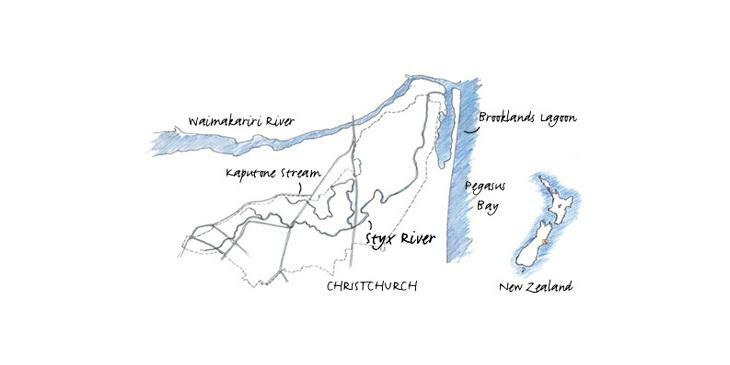 Hand drawn map of the Styx river catchment showing the Kaputone Stream, Waimakariri River and Brooklands Lagoon. Christchurch Area showing Waterways, Swamps & Vegetation cover in 1856. Over the past 150 years the Styx River and associated waterways and wetlands have been extensively modified through land use practices (eg farming, drainage activities). The river's location on the northern edge of the Christchurch City also means that the Styx is coming under increasing pressure from urbanisation. Researching a range of values provides a greater understanding of the many issues currently causing concern. Key issues are discussed below. Although the Styx River system has been highly modified with few remaining remnants of native vegetation, it retains core wetland habitats and acts as an ecological corridor for upstream and downstream migration of birds, fish, invertebrates and plants. Native freshwater fish such as the short and long finned eel, black flounder and whitebait occur within the river system, along with the introduced brown trout. The Styx catchment is home to many sensitive animals such as mayflies and caddisflies and these provide a useful indicator of stream health. Large areas of the catchment are identified for urbanisation. Managing the affects of development on wildlife values and natural processes will be critical to protecting these values in the long term. Issues as a result of urbanisation and/or land use practices include a reduction in water quality and loss of spring flow, sedimentation, poor riparian zone management practices in some areas, inadequate buffer zones and screening, fish barriers such as the floodgates, loss of both wetlands and bush habitat particularly in the hinterland, limited ecological knowledge and fragmented research. Historically, the catchment contained extensive wetland areas with much of the water originating from springs in the upper tributaries of the Styx River. This flow was then supplemented by local storm events through surface and sub-surface drainage. Today there are nearly 900 wells within the Styx catchment allowing water to be drawn for a variety of purposes including horticulture and farming. Additionally, new and existing residential developments create large areas of impervious surface, which reduces the amount of water seeping back into the ground. These, and other factors have led to a reduction in base flows, particularly in the upper reaches of the Styx River and Kaputone Creek. Not only is it important to protect baseflows, but consideration also needs to be given to managing storm events through the protection of floodplains and natural ponding areas. Water quality is also important. Consented discharges, storm water discharges, site developments, agriculture runoffs and contaminated landfills all have the potential to lower water quality. Waitaha were the earliest wave of Maori migrants to the South Island. Archaeological evidence suggests that they arrived some time during the 1300 to 1400's. The second wave of migrants, Ngati Mamoe, originated in Hawkes Bay, as did the third and last wave, Ngai Tahu. In the mid 1600's Ngai Tahu settled in Canterbury where, for them, the different components of the landscape provided important resources. The extensive wetlands and easy access to the sea made the Styx an important area for mahinga kai (food gathering), and for the cultivation and harvesting of flax. Upstream wetlands were important for embalming practices, and some of the higher terraces were used for food cultivation. Various families were given responsibility for the management and harvesting of the different plant and animal species. The Styx River catchment was associated with several of the early Canterbury runs established before 1850. These properties included Sandhills to the east, Smart and Turners Run across the north of Christchurch city, and Fooks Run between the Sandhills Run and Papanui Road. Later, these were divided into rural sections and some of the European settlers arriving in one or more of the first four ships purchased land in the area as early as 1854. The name Styx first appears in the Electoral Rolls in the 1865-66 register. Issues relating to 'heritage' include protection of Waahi Tapu (burial) sites and other sites of significance to Tangata Whenua, sustainable management of native plant and wildlife species, limited general knowledge and awareness of early European history, little visual evidence of early history within the landscape, and lack of on-site and written interpretative materials. Changes in recreation trends are being driven by a number of factors. These include an increase in population, along with an increase in the number of people reaching retirement stage. Concurrently, there has been a move towards unstructured recreational activities such as 'pay and play' or spontaneous activities. Growing awareness and concern for the quality of the environment in recreational areas has also brought about the need for change within the Styx catchment. 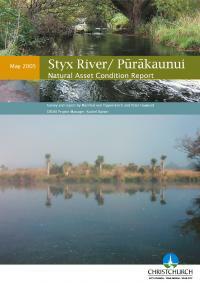 The potential for recreational activities within the Styx catchment are considerable. Many key open spaces are available for cycling and walking, and the river is particularly suited to canoeing and kayaking. Further development of recreational activities, such as jetties, walkways, seating and picnic areas would also open up other recreational opportunities based around the Styx River ecosystem. Food supplies the blood of the man and land supplies that food. Maori food gathering practices within the Styx area continued until the early 1960s when activities such as the spearing of eels under water was still being practised. Historically, people gathered food for the kaik [settlement] at Tuahiwi in a similar way that food was gathered for the Kaiapoi Pa. The gatherers collected food firstly for the community, and secondly for their own family, in a process generically known as Kai Kōha Māori. Families became specialised in these contributions by the sources from which the foods were gathered. Tuna (eels) were spilt open and dried on racks in the sun; mullet were preserved in their own oil; pipi were cooked, strung together with flax and hung to dry. Early European settlers used the water from the Styx River to drive waterwheels that provided the power to drive sawmills, flax and flour mills. Orcharding and dairying practices are still evident today within the catchment. Sites within the lower reaches of the Styx Catchment were known by Tangata Whenua as providing sources of whale and shark oils for various aspects of embalming of the dead, and as a place from which cremation ceremonies and recovery of the dead from the swamps was coordinated. Proverb and song speak of the movement of methane gases across the swamps, on the verge of the totara and kahikatea forests. Early European settlers appear to have recognised this association when renaming Pūrākaunui, the Styx. Schooled as they were in Greek mythology, Styx was also the name of the River over which the souls of the departed must travel. This spelling of the name first appears in the Electoral Rolls of 1865/66. This link with death is recognised today by the adoption of the Kotuku (white heron) as the logo for the Styx Project. Found in the lower reaches of the Styx River, it is also the bird in Maori mythology that takes the spirits from this world to the next. Itinerant groups of people all went or all stayed. In particular, the lower reaches of the Styx catchment were used by Maori as a travelling route south towards Lake Ellesmere (Te Waihora). Historically, cabbage trees were used by Maori as landmarks to guide them across the Canterbury Plains. All three versions of how the Styx received its name illustrate that early European travelled extensively through this swampy wetland. The first version maintains that early European settlers crossed the river on flax-stick rafts; hence the name ‘Sticks.’ The second version is similar, except that the bundles of flax sticks were lain in the bed of the river. The third version suggests that the name was derived from the use of flax sticks stuck in the ground to guide travellers to where the river was bridged by logs. In all cases, the spelling of the name ‘Sticks’ was later changed. European settlers also developed a plan for the Styx River to be part of a water-based transport system. 'Canal reserves' were set aside as proposed canals that would link the Halswell, Heathcote, Avon and Styx Rivers. Marshland Road now runs along the route originally proposed to link the Avon and Styx Rivers. Today, when entering the city of Christchurch from the north all main arterial routes continue to cross over the Styx River. The human spirit tends to be refreshed by interacting with wilderness areas, particularly waterways and wetlands. Across many generations, the Styx has been recognised as such a place of refreshment and renewal. As urban development continues to grow, encroaching on much of the former wetland areas of Christchurch, the need and value of retaining accessible wilderness areas becomes greater, not only for people of this generation, but also for the generations yet to come. Although the natural environment has been highly modified, and in many respects degraded, the Styx is still regarded as having high cultural values and associations. The Treaty of Waitangi and other legislation give particular importance to the relationship of Maori to their ancestral lands, water, Waahi Tapu sites (burial sites) and taonga (treasure).